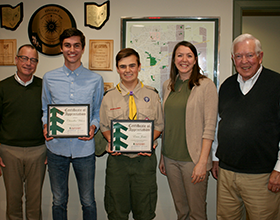 Boy Scouts Evan Jones and Chandler Wilson recently completed projects with the Centerville-Washington Park District to earn Eagle Scout badges, the highest honor among Boy Scouts. Jones, of Troop 516 in Centerville, made trail improvements to Bill Yeck Park, a 194-acre nature park. With the help of fellow scouts, friends and family, he removed a deteriorating boardwalk, improved trail drainage, and constructed and installed a new 16-foot boardwalk along Owlexander’s Tree Trek. The Tree Trek is a nature literature trail within the park. Wilson, of Troop 425 in Centerville, chose to restore the natural habitat in Grant Park, a 189-acre nature park. Wilson and his fellow scouts, friends and family removed approximately 2 acres of invasive honeysuckle along Holes Creek. The honeysuckle removal will allow native plants to thrive in the area, improving the habitat for local wildlife. “Projects like these improve the parks so they are more enjoyable for the public, and they also help the scouts build lifelong skills in planning, organization and communication that will lead them to successful futures,” said Ken Carter, Operations Manager for the Centerville-Washington Park District. Both Scouts were honored at the November 12 Centerville-Washington Park District board meeting.